Egan’s Irish Whiskey is a true heritage brand that was born in the heart of Ireland. At the turn of the 20th century P. & H. Egan was one of the most important employers in the midlands of Ireland with branch offices throughout the region. P. & H. Egan won considerable praise for its legendary Tullamore Ales and, of course, Egan’s No.8 Irish Whiskey. Six generations in the making, this charismatic range of Irish Whiskey was carefully selected by members of the Egan family and proudly represents over 160 years of heritage. To much acclaim, Egan’s 10 Year Old Single Malt was released in 2015. This was followed up with Egan’s Vintage Grain, a single grain, more contemporary whiskey. Lighter than traditional Pot Still or Single Malt renditions it is perfect for the casual enthusiast and connoisseur alike. 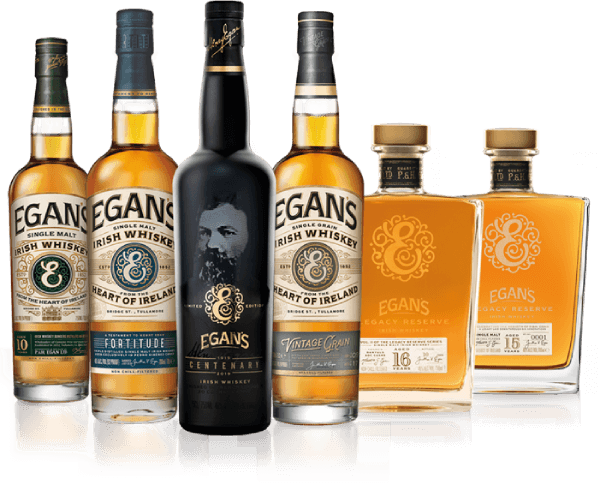 Future expressions such as the sherry aged Fortitude and the very limited release of the 15 Year Old Legacy Reserve continue the Egan commitment to provide only the finest Irish Whiskey and honour the craft of their forefathers.